The Jessica Harrington-trained Supasundae captured the £250,000 G1 Betway Aintree Hurdle in attritional conditions at Aintree. Ridden by Robbie Power, the nine-year-old son of Galileo kept on gamely in the closing stages to deny 5/6 favourite Buveur D'Air, trained by Nicky Henderson and partnered by Barry Geraghty, who was hampered by the fall of the Willie Mullins-trained Melon (8/1) three flights from home. Supasundae was second in the two mile and four furlong event in 2017 and 2018, so Harrington was delighted that the gelding had finally landed the G1 event. She said: "We didn't come into this race with Supasundae with great confidence after what happened at Cheltenham. That was the first bad race he ran for us and I just don't know what went wrong there. All I could put it down to was sticky ground and he just didn't like it. "However, today he kept coming back and finding for pressure. This trip is probably his best as he doesn't seem to get three miles. "Supasundae's been second in this race twice and it was great for him to finally win today. "He will definitely go to Punchestown. I will make up my mind at some point about whether he goes over two miles or three miles, but he'll be put in both races." Supasundae is a 20/1 shot for the G1 Sun Racing Stayers' Hurdle at the 2020 Cheltenham Festival. 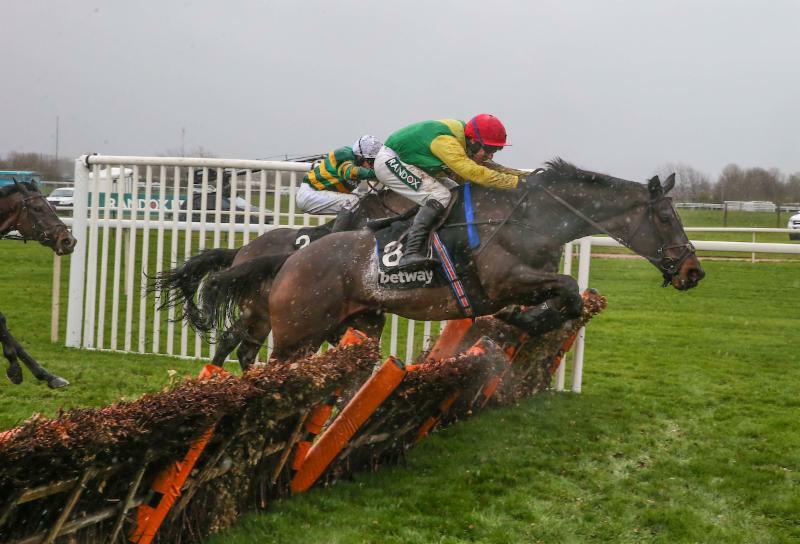 Robbie Power was full of praise for Supasundae (15/2) after the 2017 and 2018 runner-up took the notable scalp of dual Champion Hurdle winner Buveur D'Air (5/6) in the Betway Aintree Hurdle, scoring by a length and a quarter after being left on front sooner than ideal. Power, who won Champion Hurdles of his own on the nine-year-old in Ireland last year, at Leopardstown and Punchestown, said: "Supasundae is very tough. He has won three G1s now and never gets the credit he deserves. "He is just a really good horse, but he races lazily and does nothing flashily. Even at home he wouldn't beat an 85-rated horse, but he's very consistent and has run one bad race in the last two years, and that was at Cheltenham last time. "Jessie was giving out about him after that, but he will always pull one out the bag, this fella. I was actually quite comfortable turning in. Buveur D'Air looked flat to the boards and I was flat to the boards to be fair, but I knew Supasundae would keep finding." Power has enjoyed tremendous good fortune at Aintree over the years, for it was his Grand National win on Silver Birch in 2007 ythat put him on the map and he enjoyed a Grade 1 treble at the meeting two years ago, in all three of them wearing the same Ann & Alan Potts silks carried by Supasundae. He added: "I was disappointed when Melon fell because it left me in front way too soon, and he does not do a stroke in front this lad. I know he won two Grade 1s over two miles last year but this two and a half miles is probably his ideal trip. The ground was a bit soft in Cheltenham and the strongly-run three miles was a bit far for him." It's been an unlucky season for top-class hurdler Buveur D'Air, who had to accept the runner-up position in today's G1 Betway Aintree Hurdle. Mugged by his stablemate, Verdana Blue, in Kempton's G1 Christmas Hurdle, he then fell in the G1 Unibet Champion Hurdle at Cheltenham and was not helped today when Melon fell three hurdles out and slightly impeded him and third-placed Ch'tibello. In rain-softened ground he then had a slog with the last-named horse and eventual winner Supasundae (15/2), who found enough reserves of stamina to last home by one and a quarter lengths. Buveur D'Air (5/6f) finished half a length ahead of Ch'tibello who was stepping up in class after winning Cheltenham's Randox Health County Handicap Hurdle. Buveur D'Air's trainer, Nicky Henderson, said: "He's done nothing wrong and run another great race. It was a tough race to see it out in that ground and I thought he stayed well. "Tactically it was a funny race and it got a bit messy. Melon didn't help us when he fell and that gave Supasundae a run on us. It's great for Jessie [Harrington, trainer of the winner] and we'll fight another day. "I'd like to see the race again - Barry [Geraghty] said he had Melon covered and then he went and Supasundae came at us. You can get checked in races and I'm not making excuses. "Things haven't worked out and he's not had a very lucky year. It hasn't quite lived up to our hopes. "He might go to Punchestown, but I'll talk to J P [McManus, Buveur D'Air's owner] and see what he thinks, but it will be May and the decision will be ground dependent." Dan Skelton, trainer of Ch'Tibello, said: "It was a great run. We tried to challenge up the inner and didn't quite have enough to go through there, and switched wide, and we tried the whole way up the straight to get past Buveur D'Air and couldn't. "We've run a great race, a career best. He enjoys softer ground nowadays and obviously two and a half miles holds no fears. He's been magic for us in the spring, so that will be it now and we'll look after him." Owner Rich Ricci provided an update on Willie Mullins' superstar Faugheen, after he was pulled up by Ruby Walsh in the £250,000 Betway Aintree Hurdle, which was won by the Jessica Harrington-trained Supasundae. Ricci said: "Faugheen is fine, which is the most important thing, and that's great. Ruby just said he didn't seem to be himself. "I know he lost his position there coming round the bend. Unfortunately, he just didn't for whatever reason bring his A game. "Maybe we'll find something out when he's scoped and looked after, but the horse is fine. He's been such a wonderful horse; Ruby did the right thing in pulling him up. We'll have to see what happens and what comes out of it. "Punchestown is only three weeks away - if he's alright, we want to give him one more run for his Irish fans, but we'll have to see. "He's a horse who was unfortunately robbed of some of his best years by injury, but that happens in racing, you can't complain about it. He's been a wonderful horse and is a lovely fella." Walsh commented: "Faugheen just wasn't going. He jumped away down over the first but, by the time we faced across the bottom, he was lifeless. "He really backed off the third last and couldn't hold his position passing the stands. Melon and Buveur D'Air were running over me. "He is fine and sound but just didn't feel right and the safest thing to do then is pull up."